IT IS A SHOCKER, from a modern day John Law, who assisted in the transformation of the USEconomy into a giant hedge fund. Its foundation sits atop bubbles. Remember the two concepts Alan loves the most. That “innovation” is just another misleading term for broadened leverage to ramp a particular market. That “productivity” refers to more computing power for program stock & bond & derivatives trading (to earn fees), to displace workers (ending employer labor costs & fringe benefits) in the age of the great financial engineering miracle. Or is it a miraculous destruction? Would Sir Alan recall his words? Would he be proud of them? Methinks no and no. Why was he knighted by the Queen? Could it be because he helped bring down the US challenger to Old Europe? The lost US manufacturing base is a direct consequence of chronic inflation topped off by Greenspan policies. The housing bubble is one of Greenspan's more direct accomplishments. Decide for yourself. The reality is that innovation efficiently grew a dangerous reckless housing bubble, using the bizarre financial engineering alchemist tools to corruptly leverage the inflated (crowbar cranked as in amphetamines) construction into a monster which is now exploding, taking down everything tied to it. Credit scoring models were uniformly abused to grant loans to unqualified buyers who now are losing their homes and invested equity. Risk was systemically improperly priced. It fostered destructive innovation to cater to market demand in predatory fashion, to the detriment of consumers. What resulted was a temporary bailout from the 2000 stock bust with a Greenspan signature, followed by a greater housing bubble & bust with added Greenspan fingerprints, and a highly mysterious continued ongoing unjustified adulation admiration and worship of a knighted serial bubble engineer!!! He is celebrated much like the village drug dealer, only to escape criticism when the addict is down & out. The current housing bubble & bust serves as vivid testimony of the failure and inability for free people to manage money and a monetary system, without the discipline and rigorous enforcement of a gold standard. When we run out of new available bubbles to puff, we will earn a new system, which is most likely to be less friendly and less gentle with liberties and freedom. Like now! Greenspan was responsible for creating the mess, now he leads interference for reactive policy change. He has talked about a recession likelihood, but continues to deny a spillover of the housing debacle into the real economy. More accurately, he awaits the spillover. One should regard the Greenspan role as carefully orchestrated, not by any means accidental. He has created the psychological backdrop perfectly for Bernanke to cut official interest rates. Ben needed a shock to stocks, a change in sentiment and outlook. He got it. The Shadow Government Statistics folks do great work. Here is their view of reality, after removing what they call a steady stream of gimmicks in USGovt official economic statistics. They eliminate the garbage methods known as substitution, quality improvements, geometric averages, double counting, cockeyed weights, and more. We are in the midst of a queer mixture of severe monetary inflation, damaging high price inflation, yet an economic recession, weighed down severely by a housing bust and a mortgage finance crisis. Yet, the USGovt & Dept of Treasury & US Federal Reserve tag team are pumping money from the printing press like there is no tomorrow, in utter futility. They had better push harder on the accelerator, since the crises and shocks have only begun. We are in for a wild ride. See their website at ( www.shadowstats.com ). The actual price inflation for the USEconomy is near 10% and rising in trend, having surpassed 11% in the last two years. One must add over 7% added to the official CPI to enter the world of reality. These two distortions have been regular themes of my Hat Trick Letter , which celebrates its three-year anniversary this spring. The Shadow Guys articulate and quantify the distortion better than any agency or institution in existence. The actual growth for the USEconomy is near minus 1.4%, a recession, having entered positive ground only briefly in the last six years. One must subtract over 4% from the official GDP to enter the world of reality. One highly significant topic barely touched upon is the shock wave to the credit spreads and the direct linkage to USTBonds. Long-term interest rates will be falling (NOT RISING) even though price inflation abounds. The unwind of domestic credit market spread trades ensures the buyback of anchored long-term USTreasurys securities, in particular the 10-year TNote. The typical spread trade purchases a higher yield bond and sells the lower USTNote yielding bond. They invest in one of (riskier corporate bond, riskier mortgage bond, riskier junk bond, even credit default swaps) and shorted the anchoring USTNote. The entire trade benefited from the difference in risky yield from base USTreasury yield becoming smaller. As spreads widen, the spread trade loses money, and investors in them have sold quickly. The domestic unwind of the spread trades entails resetting the risk pricing. This will result in higher yields for the riskier bonds and lower prevailing long-term interest rates linked to the USTreasury long-term bonds. This is NOT the carry trade, which is the international currency spread trades, like buying a currency with higher yield and selling the currency (yen or euro typically) with lower yield. The bond yield differential trades are what can be called the “domestic spread” trade. This all means US long-term yields could come down toward the 4.0% mark previously cited here as a target. Some cavalierly and with shallow understanding claim simply that the markets are moving in a “flight to quality” or “flight to safety” which misses the point. No, that is the propaganda to divert attention away from the bond speculation dominance within the markets. Risk spreads are unwinding, and the anchor trade USTBond is seeing a massive short covering. Long-term interest rates will fall as the domestic spread trades unwind, and risk is more properly reset. The rub is that the unwind process, the short covering process, REMOVES money from the investment arena. Gold will continue to compete with USTreasury Bonds, a constant nemesis. However important the mortgage bond situation is, its impact on banks, and the effect on changes to bond yield spreads, the US stock market in the last couple weeks is trading with a 90% correlation to the Japanese yen currency . The Yen Carry Trade is the key here and now. This lends credence to the claim that some cheap Japanese money was used to speculate in the US domestic spread trades. Since the year 2003, commodity & energy contracts (their stocks also) have been tightly yoked to the mainstream stock market, as in the S&P500 index. We are about to see that yoked effect be broken. We are about to see a reversion back to the traditional lack of correlation, one which made great sense. As the cost of metals, energy, materials, and foodstuffs rises, the inherent “tax” on the economy is felt, endured, and overcome. Thus higher costs should reflect in a suppression of corporate profits. For four years, all stocks have been the beneficiary of historically unprecedented liquidity, which fits my definition of modern day Weimar inflation. Sadly, the great majority of the investment community has no idea what inflation is anymore, the tragic effect of bad information, poor teaching, and outright indoctrination. It is the growth rate of the money supply, the monetary base or aggregate. A shift is coming. 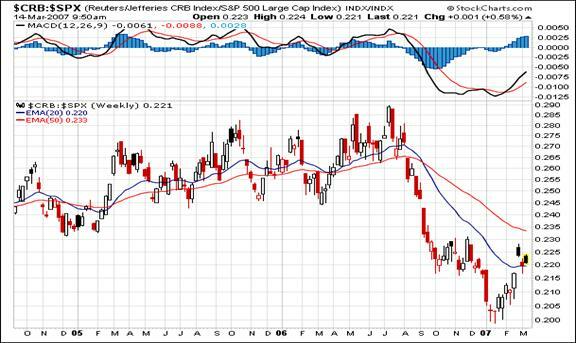 The first ratio to observe is the CRB commodity index divided by the S&P500 stock index. It suffered a decline during the energy downslide engineered by Goldman Sachs last late summer, with political motivation for election steering. Since winter, a reversal is in progress in this ratio. From this point onward, commodity prices should outperform mainstream stocks. A shift is coming. 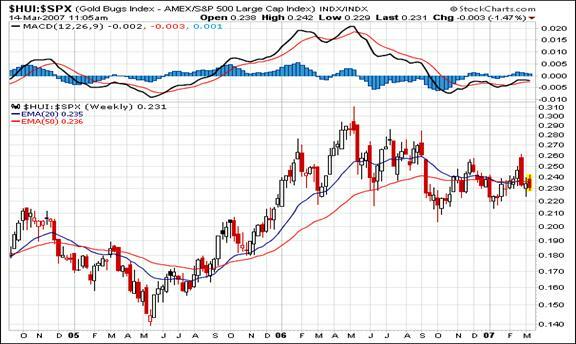 The second ratio to observe is the HUI gold & silver unhedged stock index divided by the S&P500 stock index . Despite some steady pressure in the last several weeks, the ratio has maintained its footing, and has found support from the 50-week moving average. Support appears strong. From this point onward, precious metal stock prices should outperform mainstream stocks. A shift coming. 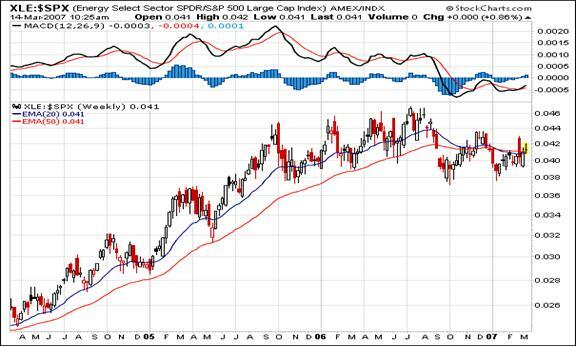 The third ratio to observe is the S&P large-cap XLE energy stock index divided by the S&P500 stock index. Its behavior in the last several weeks closely resembles that for the HUI precious metals ratio. Despite some steady pressure in the last several weeks, the ratio has maintained its footing, and has found support from the 50-week moving average. Support appears strong. From this point onward, energy stock prices should outperform mainstream stocks. We are in for a wild ride. Until the USFed awakens to the reality of the current horror show, all stocks (equities) will remain under pressure. The metal and energy stocks should fare better than the mainstream stocks, as the correlated yoke is slowly removed. Tumult is sure to come. After the USFed takes the necessary medicine, or delivers it, namely interest rate cuts, the sea change will be complete. The migration to tangible assets will proceed, as ordinary stocks and debt instruments will be shunned until the damage is fully measured. Given all the domestic spread trades to be unwound, don't expect any upward move in long-term USTreasury bond yields. The long-term prevailing rate reflect bond speculation, not inflation expectorations. They anchor too many (in)securities and will benefit from the unwind process, just like in summer 2005 when the General Motors bonds cratered. Some mistakenly call it a “flight to quality” when there is no inherent quality to USTreasurys, PERIOD. The process is mere unwinding, with buybacks of the anchoring USTBonds in some form or another. Use the above link to subscribe to the paid research reports, which include coverage of several smallcap companies positioned to rise like a cantilever during the ongoing panicky attempt to sustain an unsustainable system burdened by numerous imbalances aggravated by global village forces. An historically unprecedented mess has been created by heretical central bankers and charlatan economic advisors, whose interference has irreversibly altered and damaged the world financial system. Analysis features Gold, Crude Oil, USDollar, Treasury bonds, and inter-market dynamics with the US Economy and US Federal Reserve monetary policy. A tad of relevant geopolitics is covered as well. Articles in this series are promotional, an unabashed gesture to induce readers to subscribe.